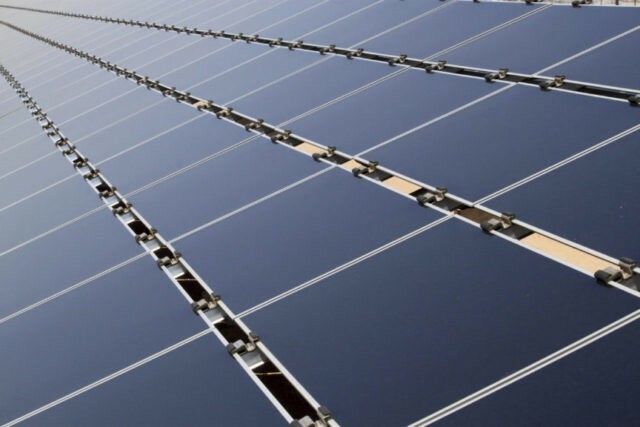 In 2012 over 7000 megawatts of new solar capacity were added. 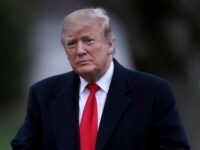 But in 2012 the boom ended abruptly as new laws on feed-in rates were enacted in order to keep the solar energy supply from going out of control. In 2017, only 600 megawatts of new capacity were expected to be added. That’s a 90% drop! 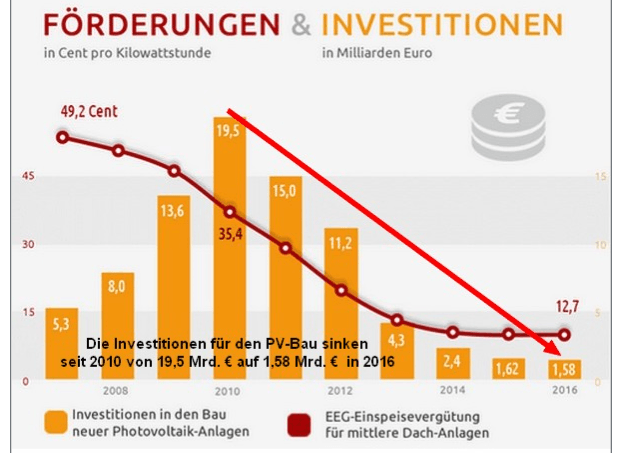 In 2007 solar operators in Germany were guaranteed feed-in tariffs of 49.2 euro-cents per KWh (kilowatt hour); today they are just 12.7 euro-cents per KWh. 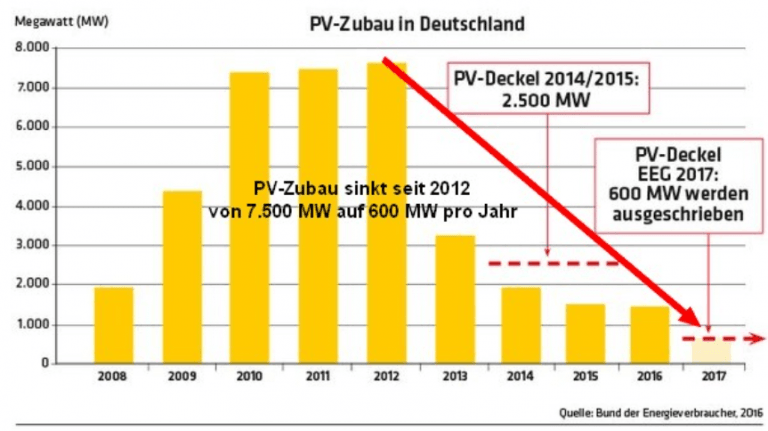 As Warren Buffett once said of his wind energy investments: “They don’t make sense without the tax credit.” It’s just the same with solar, especially in a country like Germany which sees so little sunshine. In December 2017, for example, Germany experienced a total of just ten hours of sunshine in the whole month. So while theoretically its installed solar capacity – a huge 40 gigawatts – is almost enough to power half the country at lunchtime on a sunny day, most of the time it is next to useless. Germany’s great transition from fossil fuel power to renewables – its Energiewende – will cost the economy an estimated 520 billion Euros ($635 billion) by 2020. This is roughly equal to 25,000 Euros ($30,500) per family of four. 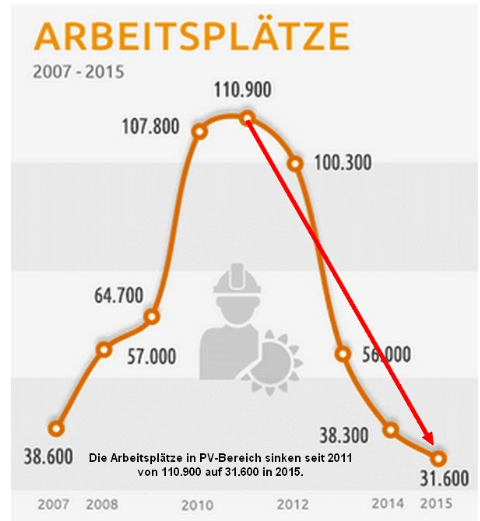 The collapse of solar industry in Germany puts into perspective EPA chief Scott Pruitt’s recent comments on renewables. Pruitt may well wish to pay lip-service to the notion that renewables “should” be part of America’s “electricity-generation mix.” In reality, however, he knows that is only going to happen with government subsidies. As soon as those solar subsidies are taken away, here’s what happens to solar jobs. That’s the real cost of “clean” energy.